The BlackBerry Torch has been one of the most popular handsets released by RIM in recent years, offering a perfect combination of touchscreen and QWERTY typing. It was always inevitable that there would be more than one Torch, but many people had simply assumed that a Torch 2 would be making an appearance during the second half of the year. RIM has instead decided to release two new Torch handsets, the Torch 9810 and the Torch 9860. While the Torch 9810 remains fairly faithful to the original design, the Torch 9860 deviates quite a bit and opts for a full touchscreen body that had led many people to believe that this handset would be released into the Storm range of BlackBerry phones when leaked photos were seen floating about on the internet. But a Torch it is, minus the traditional BlackBerry keyboard and a much more promising touchscreen phone than BlackBerry’s previous offerings. While RIM’s earlier attempts at a touchscreen phone, like the original Storm, were pretty abysmal it seems that they have finally got the hang of this new fangled technology. One of the main reasons that they now feel more confident releasing a full touchscreen phone is the major improvements that have been made with BlackBerry OS7. Some of these are aesthetic, like the new Liquid Graphics that make the latest OS much more enjoyable to use on a large screen and a lot more visually appealing then previous BlackBerry phones. OS7 now also comes with HTML5 video support and enhanced web browsing that results in faster and more seamless page rendering. These updates to the software combined with the spacious 3.7″ WVGA screen make this easily the best BlackBerry phone for surfing the net. 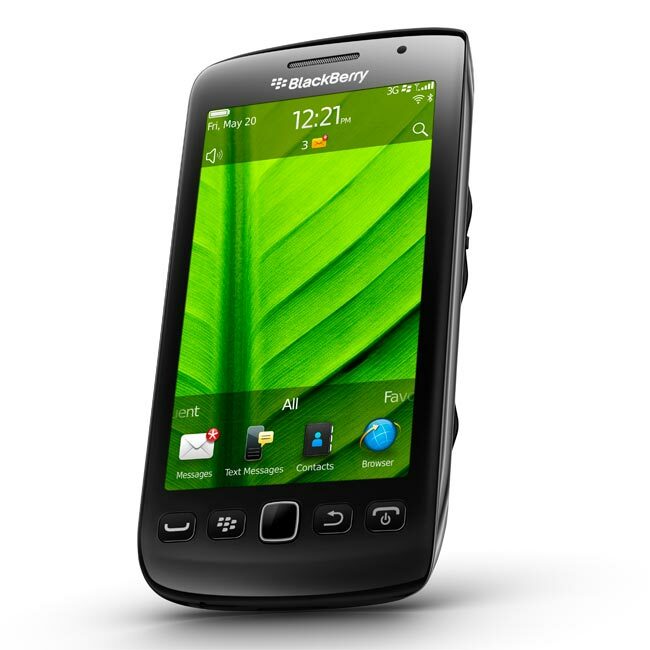 The Torch 9860 has 3G and Wi-Fi and all the usual BlackBerry services like BlackBerry Messenger and BlackBerry Maps. Also included are document editors, social networking support, fantastic music and video playback and plenty of games and apps to enjoy from BlackBerry App World. With a full touchscreen design the Torch 9860 certainly deviates away from the traditional BlackBerry design, and some people may be put off by this as it is a much loved design. However, the Torch 9810 offers a similar experience while still retaining the QWERTY keypad that many people expect from BlackBerry, while the Torch 9860 offers something that can truly compete against the current leading touchscreen phones like the Galaxy S2 and the Sensation. We will just need to wait and see whether BlackBerry Torch 9860 deals are befitting of this excellent touchscreen phone.